“Out of Imperialism,” by Qin Hui. BEIJING — China held its second-ever National Constitution Day on Friday, when citizens are supposed to renew their loyalty to the Constitution that both enshrines the Communist Party’s power and promises freedom of expression and other rights — so long as that power is not challenged. The limits of those freedoms have been underlined by the disappearance from many bookstores of a new book about China’s tortuous history of constitutional transformation by one of the country’s pre-eminent historians. The book, “Out of Imperialism,” by Qin Hui, a professor at Tsinghua University in Beijing, has garnered considerable attention since it appeared this fall. 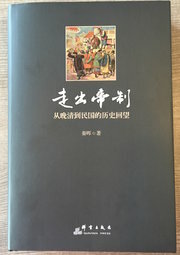 Mr. Qin is a well-known thinker with liberal views, and there was an avid readership for his book, an examination of how China broke free from the Qing imperial order only to see the promise of constitutional democracy fall apart in the early 20th century. “It has sold quite well,” said a cashier at Sanlian, one of Beijing’s most popular bookstores. “But several days ago we were told not to sell it anymore, so the books are all gone now.” The cashier would not give her name or say who issued the directive. In his book, Mr. Qin revisits a core question in Chinese history: Why did the mighty Qing dynasty decline so rapidly, then collapse in the face of Western aggression? And he asks why, after that collapse in 1911, a Western-style constitutional order did not take hold, despite the widespread admiration for such changes. “So-called ‘autocratic values’ imply not only that you advocate an imperial system, but that you do not allow others to advocate alternatives. If others oppose, you must get rid of them. But if this is the case, and others tremble in the presence of your might and declare that they accept your autocracy, does that count? Does the fact that Jews were enslaved at Auschwitz prove that the value system of the Jews was such that they were willing to be slaves and did not want freedom? Since the fall of the Qing, “democracy and a constitution have always been China’s ideal,” Mr. Qin insisted in an interview about the book published in Southern Weekend, a liberal newsweekly, on Nov. 30. “I bought one last week at Amazon, but days later I can’t find it anywhere online,” reads one of the three comments on the book’s Amazon’s page. “I guess there might be two reasons, too many people have bought it or its content is spot on. Whichever the case, it shows it’s a good book.” All three comments give the book five stars. On Douban.com, a website devoted to art and literature, a discussion page for the book has been removed. On the website of the Communist Party flagship paper People Daily, an article featuring the book’s table of contents and several excerpts has survived as well. On Friday, Weibo, the microblog site, featured “National Constitution Day” as a discussion topic, with a graphic on the Constitution listing the rights it grants citizens. It drew sarcastic comments. “Is this the biggest joke of the century?” the user Wall Street Traitor wrote. Last year, China designated Dec. 4 as National Constitution Day to commemorate the date in 1982 on which the current Constitution was adopted. In 2012, to celebrate the document’s 30th birthday, Xi Jinping, who at that time had recently become the Communist Party’s general secretary, delivered a speech, saying, “Rule of the nation by law means, first and foremost, ruling the nation in accord with the Constitution.” He added that the party would act within the framework of the Constitution and the law. Still, this has been a difficult year for those who have tried to hold the state to these promises, as scores of human rights lawyers have been detained. In October, an exhibition of a copy of one of history’s pivotal documents establishing restraints on power, the 13th century Magna Carta, was abruptly moved from Renmin University in Beijing to a more restricted space in the British ambassador’s residence. Follow Kiki Zhao on Twitter @kikizhao. Posted in Politics	Bookmark the permalink.